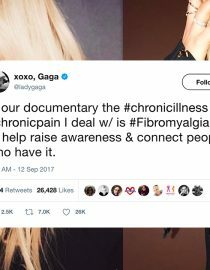 Lady Gaga revealed last week that she has been diagnosed with fibromyalgia, and fans and fibro warriors have responded with love and support. Last week she announced on Twitter that her upcoming Netflix documentary Five Foot Two, which follows her through the making of her latest album, will discuss her challenges with chronic pain. “In our documentary the #chronicillness #chronicpain I deal with is #Fibromyalgia I wish to help raise awareness & connect people who have it,” she wrote. A couple of days after that announcement she cancelled her Joanne World Tour show in Brazil due to her health, saying she said she had been taken to the hospital in “severe pain,” and that she was “devastated” and asking for “grace and understanding” from her fans. Then yesterday she postponed the entire European leg of her tour until next year. “I have always been honest about my physical and mental health struggles,” she wrote on Twitter. “Searching for years to get to the bottom of them. It is complicated and difficult to explain, and we are trying to figure it out. As I get stronger and when I feel ready, I will tell my story in more depth, and plan to take this on strongly so I can not only raise awareness, but expand research for others who suffer as I do, so I can help make a difference. “I use the word ‘suffer’ not for pity, or attention, and I have been disappointed to see people online suggest that I’m being dramatic, or making this up, or playing the victim to get out of touring. If you knew me, you would know this couldn’t be further from the truth. I’m a fighter. Since Lady Gaga’s reveal, many of her fans have opened up about their experiences with the condition. Many fibro warriors in the NewLifeOutlook community came together and sent their get well wishes to Lady Gaga, and shared how fibromyalgia has impacted their lives. “I have had fibromyalgia and chronic fatigue since 2000. Overdoing what your body can’t handle and stress triggers it the worse. I understand completely. Try to remember to rest every couple hours if possible,” said one member of the community. “I’m so glad Lady Gaga is trying to bring awareness to this illness that we battle on a daily illness. It is so hard to deal with invisible chronic full body pain. I wouldn’t wish it on my worst enemy! I’ve tried many different meds to treat it, but as I age, nothing helps much.” said another community member. Lady Gaga has been struggling with her health for several years. Back in November 2016, she announced she was struggling with chronic pain in a post on Instagram, and in 2014 she cancelled several shows due to a difficulties caused by the condition synovitis. In 2010 she said she has tested “borderline positive” for lupus and the condition ran in her family, bus she wasn’t experiencing any symptoms at the time. Ever asked yourself, "How can I help others?" If you have fibro and looking to help others, Puja talks about how to help others when you have fibromyalgia.